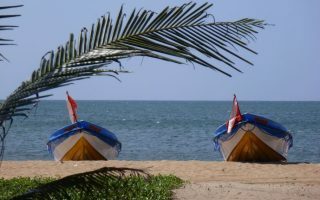 Only 15 minutes drive from the main Katunayake airport, Negombo tends to attract tourists at the beginning or at the end of their holiday. 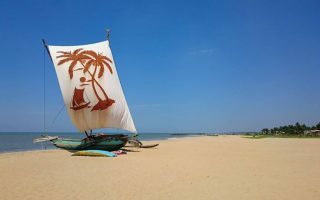 There is a tourist area known as Negombo Beach, whereas Negombo Town is more for everyday commercial life for the 120,000 local inhabitants. 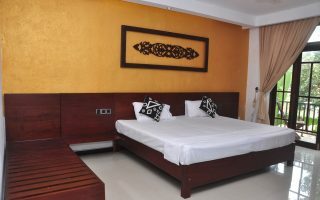 Note also the development of Negombo Beach North, an area known as Palangathure, which is quickly developing into an area of new hotels and affordable restaurants. This region is distinctively catholic with over 80% of the population of this creed. Whereas in Sri Lanka as a whole the dominant religion is 80% Buddhist. With the abundance of churches. It is no wonder that Negombo is often referred to as “Little Rome”, and was visited briefly by the Pope in January 2016. The Catholic origins can be attributed to the Portuguese who once inhabited this corner of Sri Lanka. Names such as Silva, Perrera and Fernando are today still common local surnames. Some Portuguese words have been adopted into the Sinhala language. Outside tourism, an important source of income is fishing. Visiting the Negombo Fish Market early in the morning is a major tourist attraction. You can also see them drying the fish in long rows alongside the market. Adjacent to this is the Dutch Fort which has now been converted into a prison. 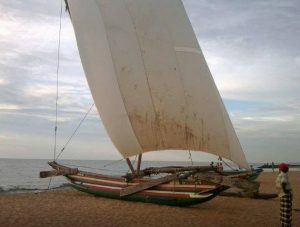 Negombo is Sri Lanka’s second largest fishing port. 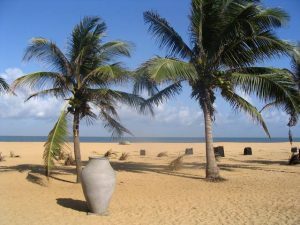 The beach of Negombo is certainly not the best in Sri Lanka. Dangerous under currents can make it dangerous for swimming at certain months of the year. A common tourist activity is to take a ride on a catamaran. Other activities include a ride along the Dutch canal or bird watching on the marshlands. 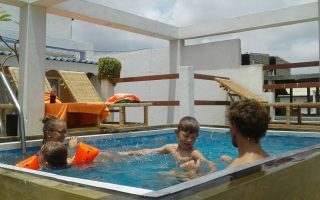 Since the coastal area has been developed to cater for tourism, the great expanse of accommodation on offer means that the tourist is spoilt for choice. Similarly restaurants have also been developed to cater for foreign tastes varying from sushi bars to pizzerias.